November 6, 2016 - Filming locations for A Feat Of Strength in Los Angeles, California. June 30, 2013 - Dale Flagler has supplied us with locations for 93 Percent In Smiling in Niagara Falls, New York. November 3, 2012 - A good selection of newspaper articles about the filming of One Tiger To A Hill and Across Walnuts and Wine were added in the Newspaper section. Thanks to Paul Johnston of Oregon City for the research. October 28, 2011 - As you may have noticed, I am starting to incorporate Facebook social plug-ins on oho66.com... still working out the bugs it's relatively stable as of today. June 30, 2011 - Mel Brown, Jr. and Mac Patterson visited Corpus Christi, Texas over the Memorial Day weekend and they report on their trip via a photo essay of filming locations for Somehow It Gets To Be Tomorrow. An article titled Everybody Hates Maharis -- Except George by Frank Fleming. November 7, 2010 - Several TV Guide articles have been posted. See the Newspaper Article Section or: TALK ABOUT PUTTING THE SHOW ON THE ROAD!, GEORGE MAHARIS: TV's HARD-DRIVING REBEL and A KNOCK DEVELOPS ON ROUTE 66. September 5, 2010 - Despite the fact that the site hasn't been updated in over three months, it has been a busy summer and several interesting items are planned for the near future. Last summer I started photographing locations for the fifth of the six Cleveland episodes - Every Father's Daughter - and this summer I finished that photography. May 23, 2010 - Over the past several weeks, the Newspaper Article Section has been expanded and improved. John M. Whalen has supplied four articles written for the Washington Post, the Washington Times and OUTRÉ. Mac Patterson has supplied several new articles from the Dallas Times Herald and Dallas Morning News. The entire Ohio66 site has undergone a minor style change to make the content more readable and easier to navigate. Hopefully, this change will also simplify the task of posting updates. March 7, 2010 - The Cruelest Sea Of All is now up. Thanks to Dave Morrison for visiting Weeki Wachee Springs and reporting on his adventure. Dave also talked with several of the mermaids featured in that episode and obtained some great behind-the scenes photos and stories. February 7, 2010 - Transcript of a 1962 Corvette News article that features the Route 66 production team on-location filming Journey To Nineveh and Poor Little Kangaroo Rat. Thanks to Nick Fleno for supplying the magazine from his personal collection. December 19, 2009 - Ed Lay of Carlisle, Pennsylvania sent me these amazing behind-the-scenes photographs shot by his wife, Peggy Fleming Lay, in October, 1961 at the Westminster Service Station during the filming of Some Of The People Some Of The Time. Thanks to the entire Lay family for allowing me to post them. November 1, 2009 - Dave Morrison has provided photos and commentary for Peace, Pity, Pardon and he has several more episodes on the way. And Nick Fleno's photos of Once To Every Man (Gloucester, Massachusetts) are finally up. October 1, 2009 - Photos from Welcome To The Wedding shot this summer have been posted. Much of the action takes place at Jim's Steak House in the Flats section of Cleveland and an extra page devoted to Jim's has been posted. September 20, 2009 - "In The Pipeline" section added to show planned future updates. August 1, 2009 - The episode Some Of The People Some Of The Time is unique because photos were submitted by three contributors: Nick Fleno, Bud Long and Michael Karberg. Plus, there is fourth who has promised to send photos soon. There may be a few remaining scenes that will be posted later but I wanted to get this page up in time for a feature article in Carlisle Sentinel on Monday. July 23, 2009 - Thanks to Mac Patterson for his photos and commentary on the Dallas, Texas episode Kiss The Maiden All Forlorn. July 9, 2009 - Photos and commentary for First Class Mouliak added. The content for this episode is especially light for several reasons. Mostly because many of the locations where filming took place no longer exist as they did in 1961. I do have more planned for First Class Mouliak but may not get around to posting it for some time. This episode was shot in the same near-west-side neighborhood of Cleveland, Tremont, where much of the 1983 film A Christmas Story was filmed. I took a slight detour off Route 66 to shoot a few photos of those locations. July 8, 2009 - Photos and commentary for Two On The House added after visits to Cleveland on July 4, 2009 and July 7, 2009. There is more planned for this episode so this update is preliminary. June 20, 2009 - Photos and commentary by Nick Fleno for the episode Burning For Burning filmed in Boiling Springs, Pennsylvania. April 24, 2009 - Newspaper scans from 1961 editions of the Dallas Morning News added. Thanks, Mac. April 18, 2009 - Photos of Bruce Springsteen's 1960 Corvette on display at the Rock & Roll Hall of Fame in Cleveland. March 3, 2009 - A few additional photos from "Even Stones Have Eyes" along with commentary by Mel Brown have been posted. I have just posted a few more very interesting behind-the-scenes shots from "Welcome To Amity" that were provided by Kinsman native, Doug Mathews. They can be seen on the "Welcome To Amity - Photos by residents" page. January 22, 2009 - Port Hueneme residents: please help identify filming locations for "The Strengthening Angels". New photos of the Texas Lions Camp posted for "Even Stones Have Eyes". December 22, 2008 - Although finding the locations for "The Strengthening Angels" is still a work in progress, I have added a page which currently presents the results of my detective work. And although virtually all of the recognizable locations in this episode no longer exist, I do expect to have some current-day photos soon. December 11, 2008 - Detective work on the filming location for "The Strengthening Angels" has paid off and it can now be stated that the show was definetly shot in Port Hueneme, California. Currently available is a newspaper clipping which was the first clue as to the actual location. Much more to follow. December 9, 2008 - A page for "The Strengthening Angels" was added in an attempt to identify the actual filming location which is generally thought to be Needles, California - a location that has been doubted by some sources. I have sent a link to this page to several residents of Needles. November 27, 2008 - A new section for Newspaper Clippings (with additional content from Butte, Montana) was added apart from the individual episode pages. Note that there may be minor display bugs that I am aware of, and working on. If you are unable to view any content on the newspaper pages then that is considered a major bug. You can either notify me (in which case I will try to fix it immediately) or wait until I have discovered the bug myself by examining the site's error logs. November 9, 2008 - More newspaper clippings added. Most of these are from Cleveland newspapers and follow the filming of epsisodes in that city, but there are some great behind-the-scenes stories that should be of interest to everyone. November 2, 2008 - A new section devoted to newspaper clippings has been added. Today, there are only a few samples but this section will grow substantially over time since there are quite a few clippings available. October 21, 2008 - Photos of the Mangrum property / Northstar bank added on the "Love Is A Skinny Kid" page. October 10, 2008 - Transcripts for the Lewisville Leader clippings added. New photo of Meriam's house in "Love Is A Skinny Kid". October 7, 2008 - Newspaper clippings from the Lewisville Leader documenting behind the scenes action during the filming of "Love Is A Skinny Kid" in 1962. Transcripts, for easier reading, will be posted at a later date. September 29, 2008 - The first few photos (hopefully, more to come) from "Even Stones Have Eyes" - filmed in Austin, Texas. September 25, 2008 - New photos and commentary for "Love Is A Skinny Kid". New screen caps, commentary and a few new photos for "Welcome To Amity" after my third trip to Kinsman, Ohio last Sunday. September 19, 2008 - I have added Google Earth Street Views to a few select locations in "Incident On A Bridge" and "1800 Days To Justice." This is an exciting new technology for getting 360º street level views of various cities around the country. Cleveland OH ("Incident On A Bridge"), Crandall TX ("1800 Days To Justice") and Lewisville TX have this technology, but Baltimore MD and Kinsman OH do not. When viewing the two episodes mentioned above look for the "Googe Earth Street View" link to the right of the photographs (where the text commentary is displayed). Remember, not all locations have this feature. Please let me know if you have any trouble with the street views by writing to me directly at the e-mail address below or by posting to the Yahoo Route 66 discussion group. Guestbook - add your comments and ask questions about filming locations. The Stengthening Angels (Port Hueneme, California) - new information about locations. Complete script for Weclome To The Wedding. Pages for all of the Florida episodes. A new article documenting the departure of George Maharis from Route 66. Do you live in or near a city where an episode of Route 66 was filmed? Take some photos of the locations used and I'll add another page here to present them to the rest of the show's fans. Comments would be nice, but they are also optional. If you do provide comments, write as little or as much as you like. You can do screen caps yourself or I will do them for you. Please write to me at the e-mail address below or simply post on the Yahoo discussion group. Full disclosure: Ohio66 is generously credited in Route 66 The Television Series. Yahoo's Route 66 discussion group... — Join the group and discuss the best television show of all time. Tophatblue - A Route 66 Recap Project — Yahoo Route 66 discussion group member tophatblue's blog at livejournal.com featuring unique 'recaps' of Route 66 episodes. The Third Man - Then and Now... — Orson Welles' "The Third Man" is one of my favorite movies and this site shows now and then photos of filming locations in Old Vienna. The Fugitive - Then and Now... — Filming locations of another great show of the era on a site dedicated to its star: David Janssen. The Andy Griffith Show... — Filming locations on the Desilu back lot in Culver City, California. The Cleveland Orchestra... — The world's greatest orchestra. 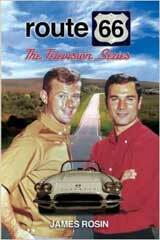 Hulu TV... — Watch uncut episodes of your favorite 1960s TV shows (including Martin Milner's Adam-12) with limited commercial interruptions (approximately one minute for a half-hour show! ).